Jon Welsh is likely to miss the rest of Scotland's Six Nations campaign after fracturing his hand in the defeat to Wales on Sunday. 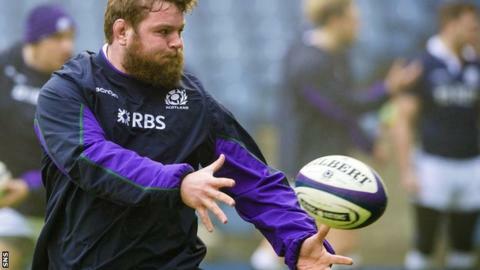 His team-mates Gordon Reid and Richie Gray will undergo scans on Monday on knee and arm injuries respectively. Prop Welsh scored Scotland's second try as they lost 26-23 at Murrayfield in their second Six Nations match. Reid and Sam Hidalgo-Clyne will also be treated for concussion after suffering head knocks against the Welsh. Glasgow's Reid came off on Sunday after sustaining a blow to the head and straining his knee. The loosehead prop is "symptom free" from his head knock but it is being treated as a concussion, requiring him to undergo the mandatory graduated return to play protocol. Hidalgo-Clyne finished the game but developed mild symptoms of a possible delayed concussion. The Scottish Rugby Union confirmed a "number" of other players have required treatment after Sunday's game and will be monitored by Scotland and their clubs' medical teams. The Scots, who also lost their opening match of the Six Nations against France, are next in action against Italy at Murrayfield on 28 February.